Miriam Levine says, “I like to live in and wander thru South Beach, the setting for many of my poems.” Her most recent book, The Dark Opens (2008), was chosen by Mark Doty for the Autumn House Poetry Prize. 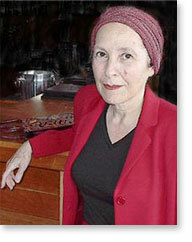 She is the author of three other poetry collections; In Paterson, a novel; and Devotion, a memoir. A recipient of an NEA fellowship and grants from the Artists Foundation, Levine is at work on a new book, Beauty Secrets of the Dead and other Poems. Her work has been published in such places as Paris Review, and Kenyon Review.